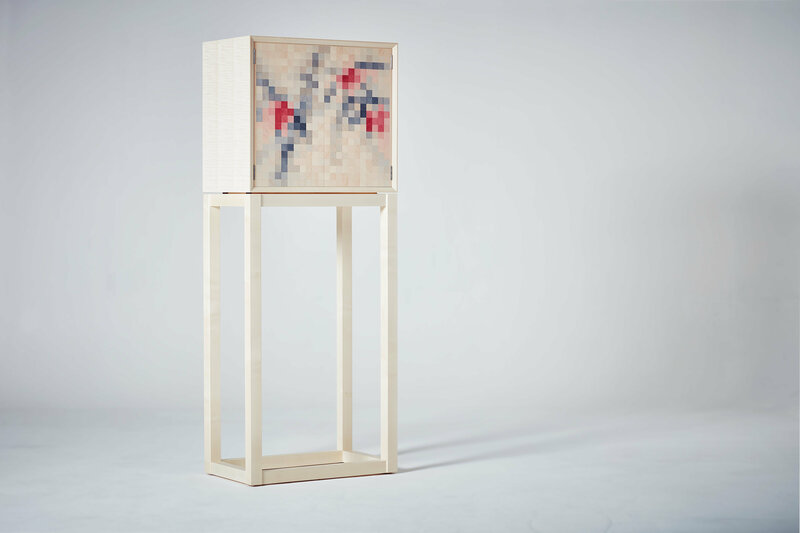 Kevin Stamper presents a range of furniture, wall art and objet using his signature pixelated style in his first solo pop up exhibition at 67 York Street Gallery. Visit the gallery between 18th and 27th October (23rd and 24th by appointment only) 10.00am – 6.00pm. “The tantalizing tipping point between a simple collection of coloured squares and an identifiable image is fascinating to me; as the eye takes in the work, the mind tries to organize the image into a recognizable object or impression. The viewer moves closer, then withdraws, squints and tilts their head as an image begins to explain itself, sometimes immediately, sometimes evolving at a gentler pace as the composition is dwelt upon. The squares, or pixels, are made from hand-dyed sycamore veneer and each one is unique, possessing its own natural grain pattern and texture. I enjoy the way this gives the material its own voice and an element of control over the final picture: there can be no thought to the blending of colours or textures, each square has its own boundaries and steadfastly maintains its individual presence. Likewise, the notion of line is a redundant concept, the composition relies solely on the relationship of the squares to one another, they are at once individual but never detached.